It sounds a bit strange, being that this team is just three months removed from winning the World Series, but a youth movement could do them some good. I'm not saying they should become the Florida Marlins are try to put high school kids out there, but promoting some of the prospects now could pay off largely, especially down the line. Ryan Howard is the best home run hitter in Major League Baseball. He is the type of player a team wants to have as long as possible. When Ryan Howard won the NL Rookie of the Year award in 2005, he was 26 years old. Imagine how many home runs he may have hit, or games he could have won, had he been promoted at 21 or 22. We were fortunate to watch Jim Thome don a Phillies' uniform for a few years; he was truly a class act during his time in Philadelphia. But Ryan Howard was a budding star, with his path to the Majors blocked for a few years that he could have been smashing home runs over the walls at Veteran's Stadium. Let's see what Carlos Carrasco has in that "million dollar arm." While Carlos Ruiz has more than earned the right to be the number one catcher, Lou Marson is likely the catcher of the future, and looks as though he may have tremendous potential and talent. Chris Coste has been another class act throughout his career, but is also 36 years old and his numbers have declined since his breakout rookie season in 2006 when he hit .328 with seven home runs. He followed by hitting .279 in 2007 with five home runs, and .263 with nine home runs in 2008. His average has severely declined, and while he hit a career high nine home runs in 2008, two more than his previous high, he had 76 more at bats in 2008 than he did in 2006. Coste has been a good back-up catcher, and a great teammate. Unfortunately, his skills appear to be declining a bit, and not that many people are interested in reading a sequel titled the 37 year old veteran. The novelty of his story has worn off, and Marson is just 22 years old and ready to start his big-league career. A few years of Major League experience serving as Ruiz's back-up would further his development and likely improve the team at the same time. There are several other options in the Phillies' farm system that could help this team immediately. They have a few speedsters, like John Mayberry. Brad Harman hit only .100 in his ten at bats in 2008, but he showed potential during his time on the roster. He hit into some bad luck; a few outs he made where hard hit balls. Jason Donald could be a tremendous second baseman, so much so that if Howard leaves in a few years, rumors are Utley would move to first and Donald would play second. Some Major League grooming would do Donald a ton of good, and could help the team, especially is Utley is unable to go on opening day. None of these prospects should have the opportunity to become regular starters, with the exception of maybe Carrasco, but getting them to contribute and develop into big-league ballplayers in 2009 could pay large dividends to the Phillies moving forward. 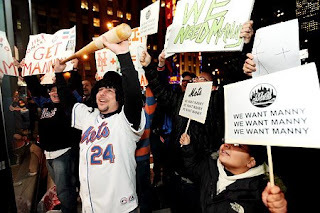 The New York Mets fans have staked their claim at wanting Manny Ramirez, and so has the manager, Jerry Manuel. Manny is looking for what maybe his last contract as a player, he's 36 years old and only one of 24 players in baseball to have hit over 500 homeruns for his career. He has already made over $150 million in his baseball salary alone. The Phillies passed on his services even though without having Pat Burrell on the staff to patrol left field. I wonder what would have happened if the Phillies signed him. I don't think the fans would be getting on Manny out there in left field for much. He probably would have signed with the World Series champs also. I wonder how Phillies fans would have thought about possibly signing him though. He does bring some excitement to the field with him that is for sure. Remember Phillies prospect Michael Bourn and Geoff Geary? Shane had a better year than Bourn, but Shane's homerun production is not there either. He is more of a base hit kind of player. Another former Phillies pitcher, Geoff Geary, is seeking a $2.1 million dollar salary from the Astros this year and may have to head to arbitration to get it so says the MLB Trade Rumors website. Ed Wade and the Astros have offered $1.45 mill. The writer of this blog is definetly in the wrong business for my regular day job, busting my tail for under $50,000 a year - but happy to have a job! Ryan Howard wants $18 million? Who the hell does he think he is? I would trade Ryan Howard today for the best pitcher you could find in exchange for him. I wouldn't even want the Phillies to pay him the $14 million they are willing to pay him. No way, no how. He's not worth it with all the strikeouts and poor defense. Almost 200 strikeouts for 2 years in a row? He by no means carried this team last year either. The Phillies should deal him and say "Goodbye!" and save themselves millions in the process. The team did not win on his individual accomplishments. Trade him off to a team like Kansas City or someplace like that. They'll see that by himself, he won't take a team anywhere. I think Ryan should look himself in the mirror and grab a hold of his emotions and get off this cloud that he is on. This is the kind of stuff that turns fans off, they make a measly amount and struggle to buy tickets and here comes a guy that isn't happy with $10 million dollars a year, he now wants $18 mill? Come on and be real in this economy he's way overpaid. The fans should unite and really give him stuff for playing like he does at times. I don't want to hear about all the homeruns, to me it doesn't mean anything but Howard trying to make Howard look good. The Atlanta Braves will apparently have the services of Derek Lowe next year for the 2009 season and beyond. The New York Mets were the only real team that was out there as trying to sign Lowe with any concrete offers, but somehow Atlanta walks away with him. The Phillies who have made some bad starting pitching moves in the past couple years, sat this one out. The won't be getting the services of Lowe. I don't know if I would have wanted the Phils to spend that much money on Lowe, who is 36 in April and hasn't really dominated too much especially against the Phillies in the NLCS last year. I am surprised at the way the Braves ivested in him. He is an All Star, but he has already pitched in the league for 12 years and this will be his 13th season as a pitcher. The Phillies also have thier own ace, Cole Hamels, who the team is still built around, so there won't be any competing for the ace spot for him. The only bad this is the Phillies will play the Braves 16 times this season and they will go up against Lowe more than they would have if he had stayed with the Dodgers. In other news about Phillies pitchers, Chan Ho Park is pictured at a South Korea news conference saying he won't be on the South Korea team for the World Baseball Classic. 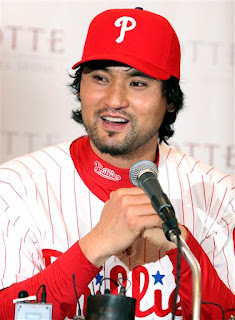 Chan Ho can't wait for the season though, and is very happy to be a Phillie. Somehow I see the Phillies having a little sushi around for Park this season, he probably won't be dining on cheesesteaks! Free JC Romero petition join the 950 ESPN Radio and FightinPhillies.com! Join our blog and the folks at WPEN ESPN Sports Radio 950 from Philly to free JC! Can the masses influence the MLB? Only time and the number of people we get to sign the form will tell... there is a bigger issue in this what's right and legal by purchasing an over the counter substance to improve one's body and how can you be wrong by purchasing something at a nutritional store and still be banned? "The Phillies sack Pat Burrell and pay Ibanez double what Pat will earn in only 2 years... who the hell is Raul Ibanez?" 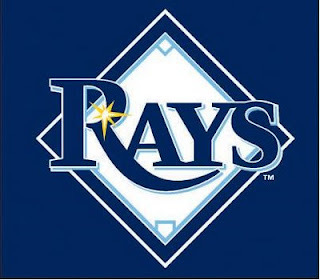 Good for Pat Burrell, I am so glad he signed with a young hungry team like the Tampa Bay Rays. I am astonished that the deal Burrell got is no where near what he is worth in my opinion. The Phillies should be ashamed to in the end kick Burrell to the curb and treat him the way they did. The Phillies showed absolutely no love towards a guy who for years was a stand up player, never caused any problems, and donated a lot of what he made to local charity organizations. Pat the Bat was the Phillie of the past 10 years, but Jimmy Rollins should stand up and take note of what the Phillies did to Pat the Bat and how they treat a player who gives their all and tried to make a difference despite having the front office of the Phillies very publicly say that they were trying to deal him and want to send him packing well before the time after the Phillies won the World Series. This is a bone head move the Eagles would make towards one of their players, not the Phillies but here we are and it's happened to Pat the Bat. This makes me very angry! The Phillies go out and get a 'nobody' in an ex Seattle Mariner and pay him premium bucks even though he is 36 years old and have the younger more in shape Burrell get treated like the Phillies did is a sin. Burrell is probably wondering what he did wrong, and really what did he do wrong? He wasn't the second coming, but he is a pretty good baseball player. I smell Pat Gillick at work in this one, with yet another overpaid free agent with the 'Gillick Connection' that have really not done the Phillies anything in my opinion. I just really took a second look at the way the Phillies are starting to do business and I am not all that happy with it at all. Jan 1, 2009 - Happy New Year and the arrival of MLB TV! The New Year always holds promise and thoughts for better times in the year to come. Phillies fans of course had a great year last year and still we hope to keep that going in '09. The team is essentially not too different from last year's team. The only difference is Pat Burrell is apparently not going to be on the team with the siging of Raul Ibanez. There is still some free agents out there, and perhaps the Phils still have a surprise move to still make before the start of the season. One great thing for me this year is the arrival of MLB TV which is on Comcast channel 280 in the South Jersey area. I couldn't wait to see what they would offer and this morning I went downstairs and popped the TV on for the first time in the new year and I tuned right in to MLB TV. I felt like the time when I was a teenager that MTV first appeared on the television. There was an exciting feeling going through me as I watched the old highlights with the great plays that we've seen in the past couple years and the greatest plays ever that we haven't seen perhaps because we weren't around to see them. I know all this has been available on the internet for downloading and view over the MLB website, but this is different now that is on tv. It's almost like having a little Baseball Hall of Fame on your tv, because they will be showing the old classic games and a lot of cool stuff outside of their great coverage they promise during the regular season. Again Happy New Year to the readers of my blogs here and on phillywebcast.com!